Let us now take a look at writing a list – or list of CSV rows to the text file. 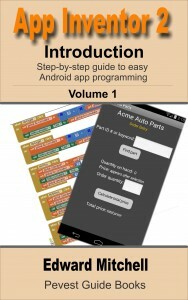 You’d best be familiar with lists (see volume 1 of my App Inventor 2: Tutorial) before starting on this. (Note: the above text previously read “or list of lists”, but that was in error. This is a list of CSV rows. Thank you to Taifun for spotting the error). 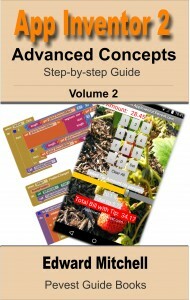 Where the file is stored may depend upon whether the app is run using the AI 2 Companion on your phone, or if the app has been converted into a .apk file and installed on your phone like a traditional Android app. And whether your phone has an actual microSD card or a simulated sdcard. This location corresponds to /storage/emulated/0/AppInventor/data on my phone, which is a folder on my phone. You will need a file explorer app – or connect your phone to a PC using a USB cable and mount the phone as an external hard drive – to see the file structure on the phone. 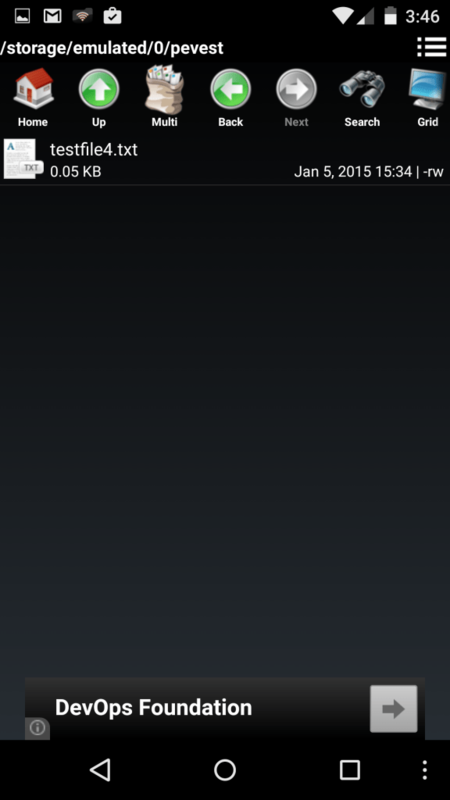 On an older LG Android phone running Android 2.2, files are written to an actual micro SD card. On the Nexus 5, there is no physical sdcard; however, Android creates a simulated sdcard. When the app is built as a .apk executable and installed on the phone, the file that your app has created may be invisible! You can run your app – it will write to the file and read from the file, but the location of the file may be a mystery – apparently nowhere on your device! To solve this problem, we must first create a file folder where the file should be stored. 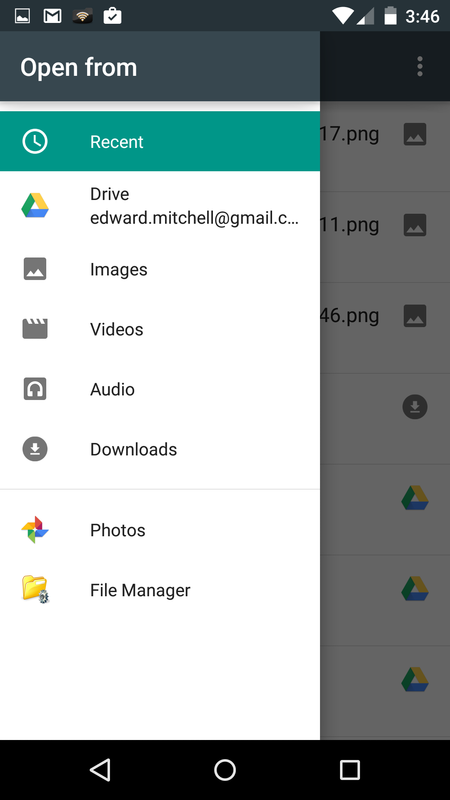 To create a file folder on your phone (or table), install an app from the Google Play store that lets you explore the file system on your device and create subdirectories in the file structure. I use File Manager and recommend it. Install this app and then use it to become familiar with the file and folder structure of your Android device. If you connect your phone to your computer using a USB cable and mount the phone as a disk drive so that you can look at the files from your computer, you may discover your folder is missing! What happened? I have not thoroughly explored this topic but I believe the emulated storage (the simulated sdcard storage) uses a file system technology named ENT4 (like Windows OS uses FAT32 or NTFS file system technology and Mac OS X uses those plus the Mac OS X Journaled file system). The problem is ENT4 is not recognized by the Windows OS: the simulated sdcard storage is invisible to Windows. A simple way to copy the file to your computer is to email it from your phone (or tablet). Once the File Manager app has been installed, you can use it within GMail to navigate to your own file folder (/pevest in this example). In the GMail app, compose a message and click on the paperclip icon (for attaching files). Select the File Manager icon on the pop out menu (see example below), and then navigate to the folder and tap on your selected file to attach the file to your email. Email the file to yourself, log in on your computer and download the file from email. 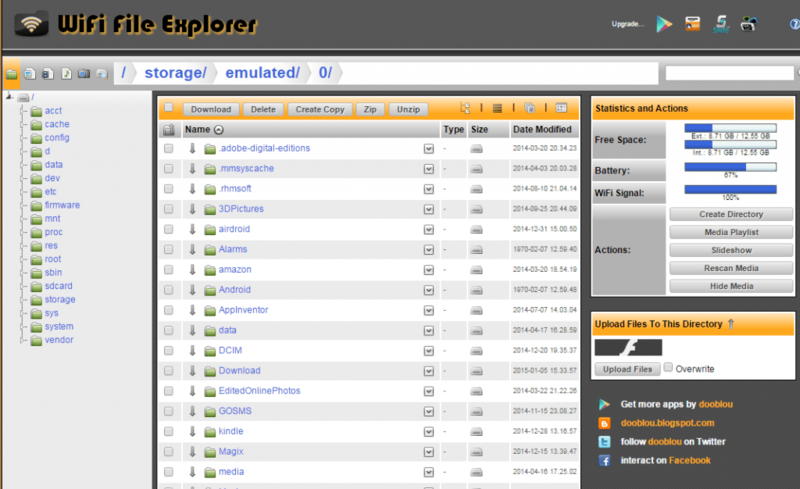 Click on storage, shown in the left column, then click on emulated, and then click on 0 – and find your file directory (pevest, in this example). Open the directory and click on the file (testfile4.txt in this example) and the file is loaded into your browser window. I’ll go back and take a look at what I was trying to accomplish with that example – to see whether a list of csv rows was, in fact, what was intended, but incorrectly described as a list of lists, or if I really should have a list of lists. Thanks of the heads up! The problem is also that the file may be stored in an ENT4 file system partition, as it appears to be on my phone when I tested that. I was trying to address questions I received from readers as to why the file was not visible when the phone was connected to Windows via USB, and how they might go about finding the file on their phone. 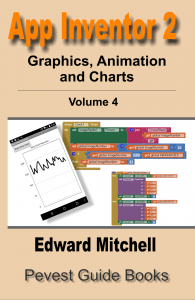 Many of the people using App Inventor were probably not familiar with the concept of file systems nor that their phone or tablet has a file system. It is definitely true that programs run in the AI Companion are handled quite a bit differently than apps that are built and installed separately and I think it is a good suggestion to make that more clear! Thanks! 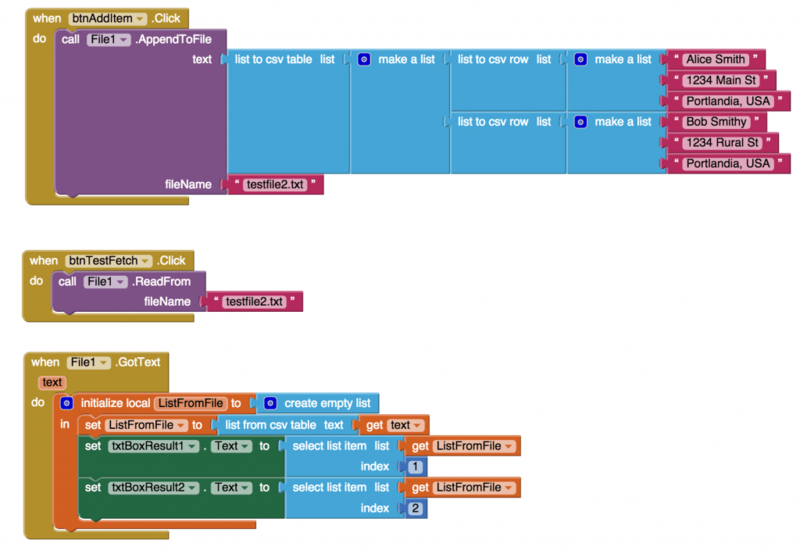 Pingback: Update: Reading and writing text files with App Inventor | App Inventor 2 – Learn to Code! 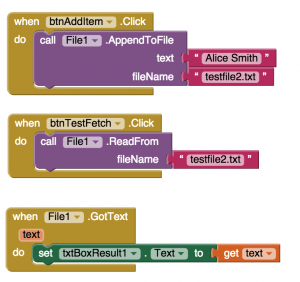 Pingback: Free-Download App Inventor Text Files Cheat Sheet | App Inventor 2 – Learn to Code! is there any possible way to save on my phone dropbox ? My problem is create folder. How to make app2 with cerate folder? Because my ideas camera with picture save to folder. 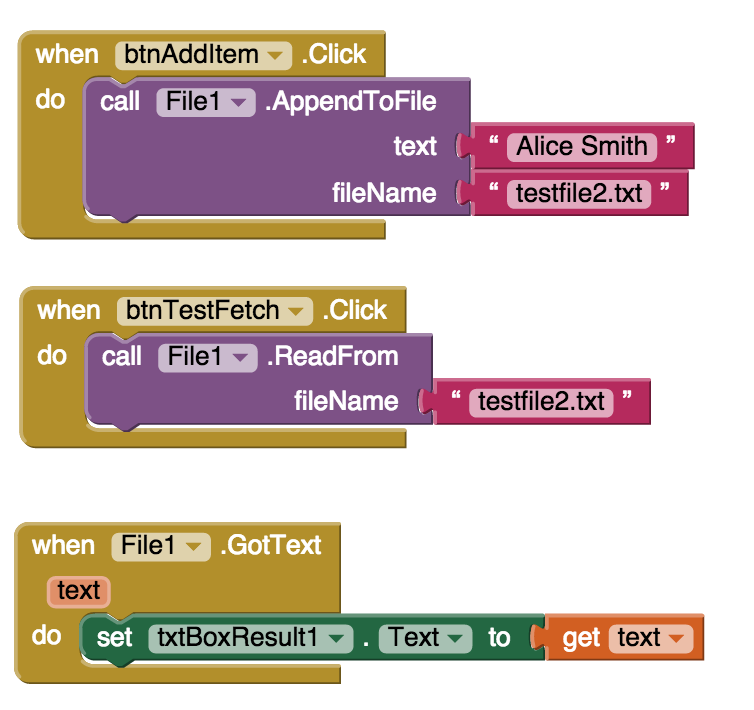 I do not know of a way for an App Inventor app to create a folder; I think that feature is missing. 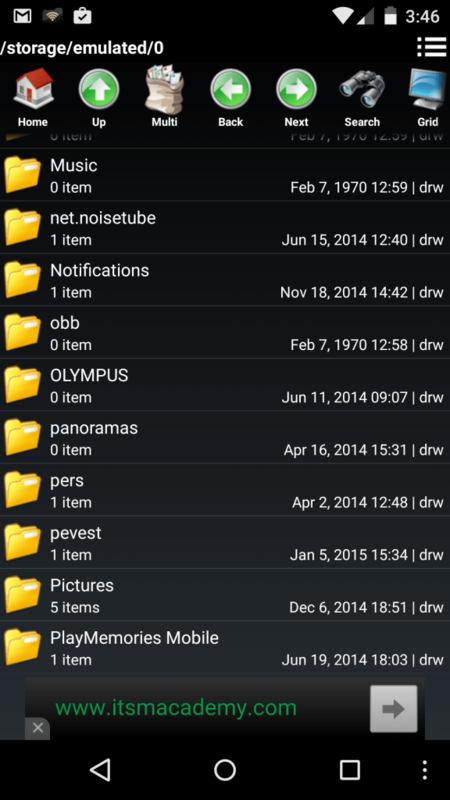 One can be created manually by using a separate File Manager app (free, in the Google Play Store). 1. Read lets say a location (latitude, longitude and description) from a list or table of these, one record at a time? 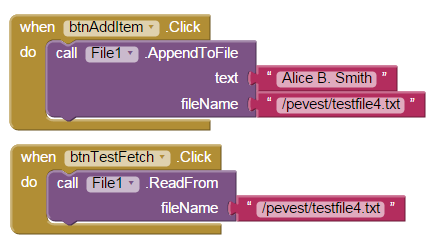 do you use a WHILE or For loop to access these values? For a list, you can use the List method named “Is in list?” and pass to it the list to search, and the “thing” you wish to search for. For a table, I suppose you could convert the table into a list and then use the List search. 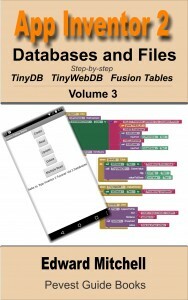 Use “List from CSV table”, from the List components. Alternatively, yes, you could use a loop to scan through the list or table. But try using one of the built in searches first to see if that can solve your app requirement!